Home Politics Nuclear Mr. Obama, please elaborate! 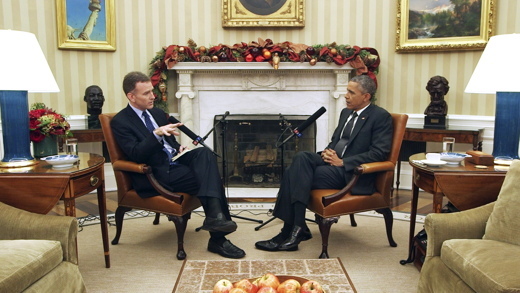 How a principlist daily reacts to President Obama’s Iran comments in an interview with NPR in late December. The comments President Obama made in an interview with NPR in late December continue to draw reaction from the Iranian media. Earlier IFP translated the viewpoints of Mehdi Motaharnia, a university professor, on the American President’s remarks. On January 3, Resalat* daily published an analysis of the same comments, from a different angle though. 1. No doubt, his admission that Iran has legitimate defense concerns is the most important part of his comments in the interview. As the highest-ranking political official in the United States, Obama has described Iran’s concerns as legitimate and held up the eight-year war between Iran and Iraq as reason for such legitimacy. But the conclusion he draws is that Iran’s support for resistance group is unacceptable. In other words, there is no proportionality between the opening and ending of his comments. Certainly, such incompatibility has nothing to do with a confused state of mind, nor does it stem from his inability to strike a simple balance – rather it is the result of Washington’s fear of Tel Aviv and the Zionist lobby. On the other hand, such incompatibility is influenced by the White House’s macro-policy of shading the realities of the Middle East in line with American interests. The footprints of this macro-policy and the fear Tel Aviv has instilled are still seen in Washington’s foreign policy. But the fact that the highest-ranking American official admits that Iran has legitimate defense concerns is worth pondering. As the highest-ranking political official in the United States, Obama has described Iran’s concerns as legitimate and held up the eight-year war between Iran and Iraq as reason for such legitimacy. But the conclusion he draws is that Iran’s support for resistance group is unacceptable. 2. According to public international law, when a country admits something, their admission bears consequences. The president of the United States has openly admitted to Iran’s “legitimate defense concerns”. He has even taken one step further by mentioning the war Iraq imposed on Iran. By the way, how can one assess the ramifications of such admission and follow the case legally? What is interesting is that Obama has been as conservative as he could have been in his recent comments and has linked the legitimate concerns in question to the past, that is to say, the Sacred Defense era [the Iran-Iraq war in the ‘80s]. He has failed to make any mention of American, and most recently British, bases in the Persian Gulf. Also missing from his comments are establishment of American bases in countries to the north of Iran, Incerlic Air Base in Turkey, presence of US forces in Afghanistan, the threats posed by the Taliban and Alqaeda in Pakistan, as well as IS and other Takfiri groups, which are a product of the West, in Iraq and elsewhere. 3. The constant threats posed by the West, […] and thousands of other factors require us to build on our religious instructions and realities on the ground to shore up our defenses in the face of threats. Based on religious instructions, the Islamic Republic of Iran will never conduct the first strike, nor will it ever take action in favor of war in the region or around the world. In fact, any Iranian military action will be defensive in nature. In nuclear talks we have reiterated again and again that under a religious edict issued by the Supreme Leader, the Islamic Republic views development and delivery of atomic weapons forbidden. Based on religious instructions, the Islamic Republic of Iran will never conduct the first strike, nor will it ever take action in favor of war in the region or around the world. In fact, any Iranian military action will be defensive in nature. 4. Former Zionist Premier Ehud Olmert has admitted that there are scores of nuclear weapons in the Israeli arsenal. That means the occupying regime of Israel is at the center of Iran’s legitimate defense concerns. Under such circumstances, Iran’s support for Islamic resistance groups in Lebanon and Palestine and our efforts to shore up resistance are both religiously and realistically justifiable. If international theorists took a realistic and unbiased look at the Middle East and the record of the Zionist regime, they would understand that Iran’s defense concerns are legitimate and our concentration on defensive weapons and long-range missiles are part of efforts to promote our deterrence in the face of a serious threat. 5. The fact of the matter is that White House officials are not in a legal position to label Iran’s defense measures as legitimate or otherwise. Neither do they have the authority to set limits for Iran. Legally speaking, the US is not even entitled to recognize such legitimacy. The decisions our country makes about its defense capabilities are on the one hand based on religious instructions and, on the other, on regional equations. Besides, Obama should not forget the fact that his respective country is not only not in a position to pass judgment on the legitimacy of Iran’s defense measures, but the US itself is an integral part of Iran’s legitimate defense concerns. America’s constant support for the Zionist regime, its military presence in neighboring countries and Washington’s creation of regional crises like the emergence of IS and other Takfiri groups cannot be denied by Obama. As for the Iraq war which has been mentioned by Obama, the US, as the main Western supporter of Saddam’s Iraq, should be held accountable for the blood of tens of thousands of Iranian combatants spilled during the war. He should not forget the fact that his country does not call the game of crisis, it is part of the game. The fact of the matter is that White House officials are not in a legal position to label Iran’s defense measures as legitimate or otherwise. Neither do they have the authority to set limits for Iran. 6. So it seems that Obama needs to elaborate on what he has said. If he understands the legitimate defense concerns of the Islamic Republic, why the question of Iran’s missile capability has been brought up in nuclear talks? In two crucial rounds of talks, that is to say Vienna 6 and Vienna 8, American negotiators used the same issue to prevent the conclusion of a final deal. In Vienna 4, they used the same issue to block the drafting of a deal. Besides why is it that Obama, who appreciates Iran’s legitimate defense concerns in light of regional threats, rushes to the defense of the despised, infanticidal Zionist regime whenever the question of Iran’s support for Hamas and Hezbollah which is designed to help prevent the continuation of genocide and barbarism pops up. Iranian Foreign Ministry officials had better ask Obama to elaborate on his understanding of Iran’s “legitimate defense concerns” and that could be an example of constructive dialogue, even if it is brief and indirect! * Resalat is a principlist daily which first appeared on newsstands more than three decades ago. It was backed by bazaar merchants who supported the movement led by the late founder of the Islamic Republic. The daily now represents the viewpoints of conservatives who play a prominent role in the country’s political equations.